If unspoiled scenery and cliff-framed coves appeal, the mountainous isle of Skopelos in the Agean Sea is a sure bet for your island adventure. The island where Mamma Mia was famously filmed, explore Skopelos Town and its old quarter Kastro, nestled atop a hill. South you’ll find the pine-clad village of Stafilos, and further inland you’ll be met by olive groves, lush forests and scenic walking trails. By night the city springs into life, thanks to its animated restaurants and bars. 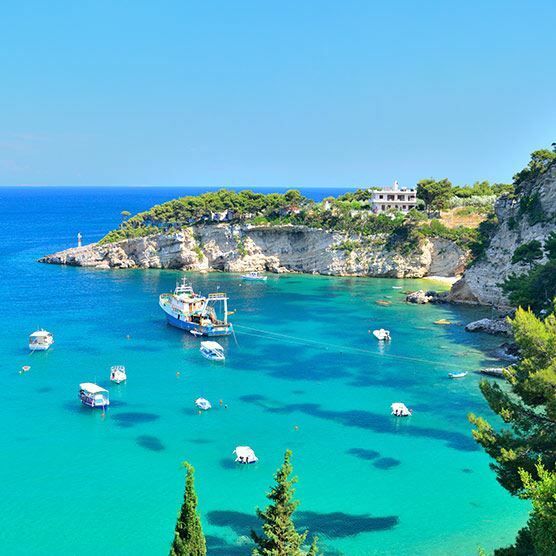 How to get there: Fly to Skiathos and take a 45-minute boat ride to its shores – the journey will be worth the effort! Check out where to stay in Skiathos. This gorgeous green island is scattered with pretty pebble beaches, lush forests and hidden hilltop villages – its unspoiled environment a major draw for nature lovers. Your first stop should be the national Marine Park, full of rich wildlife where you can spot rare species including Monk Seal. The idyllic bay and capital of Patitiri is a must-visit too, complete with a whitewashed town, pretty harbour and variety of taverns, patisseries and local shops. How to get here: This serene island doesn’t have an airport and the closest one is in Skiathos, making it the perfect day trip to visit from the neighbouring island. This dreamy Dodecanese Island is best known for its never-ending beaches and pretty whitewashed villages - with plenty of party towns to match! If you're all about the beach Agios Stefanos in laid-back Kefalos is a crowd-pleaser, or why not discover natural wonders such as Plaka Forest further inland? The capital Kos Town is the place to be if you're looking to party, with buzzing bars backing the picturesque harbour, or the young and fun can hit Kardamena, for its lively crowd. How to get there: You can fly directly to Kos from the UK and it makes a great base if you want to venture out. You can easily visit nearby Dodecanese Islands, the Cycladic Islands, Crete and even Turkey! Find out about where to stay in Kos. Santorini’s hilltop villages dotted with vibrant blue-domed churches and crystal-clear waters need no introduction. For island lovers, Santorini’s chilled resorts are utter bliss - Kamari and Firostefani are great for traditional Greek charm, while the classy town of Oia located atop the stunning caldera, is one of the island’s most famous hilltop spots. Get there early to avoid the crowds and don’t miss the burnt orange sunsets from the clifftops. How to get there: You can fly directly from UK to the capital of Santorini, Thira in approximately 3 hours 50 minutes. This gem in the Ionian Islands is a great destination for family beach holidays, with a long sandy coastline, sugar cube villages, lush olive groves and glistening seas. Old Perithia offers a slice of authentic Greece, with peaceful vineyards and ancient ruins, while lively beach resort Sidari has entertainment on tap. Head to beautiful Paleokastritsa village during your Corfu holidays for its bougainvillea framed courtyards and picturesque beach, make a splash at nearby Aqualand and dine in Corfu Town. How to get there: Corfu is an easy destination for exploration - you can get a direct flight from UK to Corfu in approximately 3hours and there are regular ferries connecting to mainland Greece and parts of Italy, too! Despite being the smallest of the Sporades, Skiathos certainly has a lot to shout about. There are over 60 beautiful beaches to choose from on this peaceful island, so sun, sand and sea is to be expected. You’ll find some of the best golden sands in the South, surrounded by no less than sleepy villages and family-run tavernas, or why not wander stylish Skiathos Town, where designer boutiques, yacht harbours and high-end restaurants are out in force. How to get there: You can fly directly from UK to Skiathos in 3 hours. There are plenty of day cruises to other islands of Sporades and Pelion, too. This gorgeous volcanic island in the Cyclades is the perfect place to escape the hustle and bustle of bigger neighbours and enjoy the unspoilt landscape. Nicknamed ‘the Island of Colours’, family-friendly Milos has a captivating and colourful coastline full of fascinating rock formations worth exploring, with Sarakiniko, Kleftiko and Fyriplaka among the most beautiful. Take time to potter around the fishing villages on the northern side of the island too. How to get there: There are no direct flights to Milos, which is why it is such a serene escape, but you can catch a ferry from Piraeus, Athens or Thira, Santorini. The largest of the Dodecanese Islands is a big hit for family holidays, with atmospheric beaches, historical towns and bundles of fantastic restaurants and bars. UNESCO-listed Rhodes Town is well worth a visit if century-old sites are your thing, as is the charming village of Afandou. Once you’ve hit Lindos beach (overlooked by the iconic acropolis) head into Rhodes Town for its Medieval citadels, superb harbour and string of restaurants and bars. How to get there: You can fly directly from UK to Rhodes in just under 4 hours, although it’s easy to reach from other islands too, including Athens. The largest and greenest island in the Cyclades, Naxos oozes natural beauty thanks to its contrast of white sand beaches, rolling valleys and mountainous backdrop. The toasty Mediterranean climate averages at 25ºC, which is ideal for both lying on the beach and wandering the island’s fertile landscape, traditional villages and archeological sites. Perfect for a romantic couples holiday, this idyllic isle is easy to explore and you can hop on a ferry to neighbouring Santorini in approximately 90-minutes if you wish, depending on your choice of boat. How to get there: Naxos is a great holiday base if you want to island hop. It’s easily accessible by flight or ferry from Athens, with other connections from Mykonos, Santorini, Paros and Koufonsia. Folegandros is somewhat of a well-kept secret in the heart of the Aegean, the remote island is best known for its scenic landscape and laid-back vibe. This quiet island escape is all about R&R, the photogenic beaches of Angali, Karavostasi and Agios Georgios offer breathtaking views, while the clifftop town of Hora has an enchanting medieval center, quaint whitewashed squares and old-fashioned tavernas that fill the sun-set streets with music, raki and a lively atmosphere. How to get there: Unsurprisingly, there is no airport in Folegandros so your best bet is to hop on a ferry from Piraeus, Athens. In summer, there are daily ferries connecting from Santorini too. The capital of Greece is abuzz with atmosphere, with traditional tavernas, ancient culture, lively squares and historic wonders gracing every street corner. All of the main attractions are easily accessible by foot in the central area, so you can catch sight of the Acropolis, Parthenon and ancient marketplace of Agora. Combine your city break with a coastal escape with superb beaches in the Glyfada district and Marathon district, before indulging in mouthwatering Mediterranean cuisine at an authentic Greek restaurant. How to get there: You can fly directly from UK to Athens in roughly 3 hours 30 minutes. Once you’re there it’s easy to venture to other islands from Piraeus harbour. This enchanting island is part of the Saronic Gulf Islands and just 90-minutes from the capital, yet it feels like you’ve stepped into another world when you pull up in the busy port. Donkeys wait patiently on the cobbles to carry your luggage through Hydra’s quaint main town, a maze of narrow houses, museums and jewellery shops climbing up from a horseshoe harbour; while the pretty pebble, sand and pine-clad beaches offer ultimate relaxation. Dine by the water in Omilos and Marina’s Taverna for gorgeous food and views to match. How to get here: The best way to reach Hydra is to fly into Athens International Airport and hop on a catamaran from Piraeus. There are no vehicles on the island so be sure to pack your walking boots.